4. In the end, the biggest part, ready-made Workshops on Intercultural Dialogue. The process of intercultural dialogue and learning, which we see as the key resource on a way towards a culture of peace, is a central one in the concept and work of SCI (Service Civil International), in the informal and the non-formal learning process of our volunteers. Because of this we decided to develop a toolkit on intercultural dialogue, which aims at supporting volunteers and trainers holding non-formal education sessions in trainings, seminars or workcamps. To do this a team of volunteers gathered and collected information on the concept of intercultural dialogue, methodological information on how to build a non-formal education session and hold it and to put together the in our eyes most relevant games and workshops. 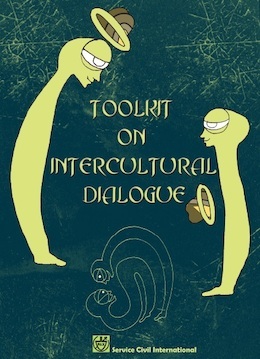 Therefore in this toolkit you find first a theoretical introduction of intercultural dialogue, then find a short information on SCI and its history related to this topic, followed by guidelines and inspiration for non-formal education, and then in the end reaching the biggest part – the workshops. Together all these things should give you the ability and inspiration to hold non-formal education sessions on projects, trainings, seminars or in any other setting you will think about and give the participants the possibility to reflect on their own intercultural learning process by facilitating their discussions.